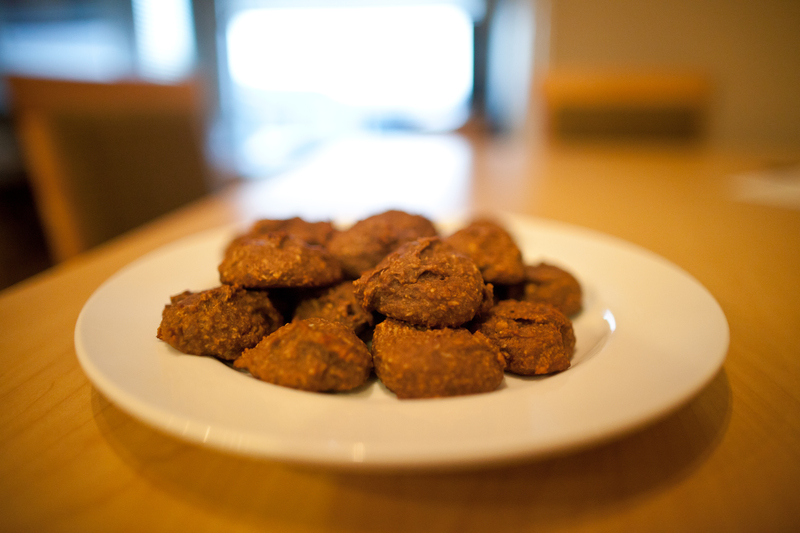 7 Ingredient Cacao-Banana-Nut Butter-Oatmeal Cookies. Alone, banana and chocolate are superb. 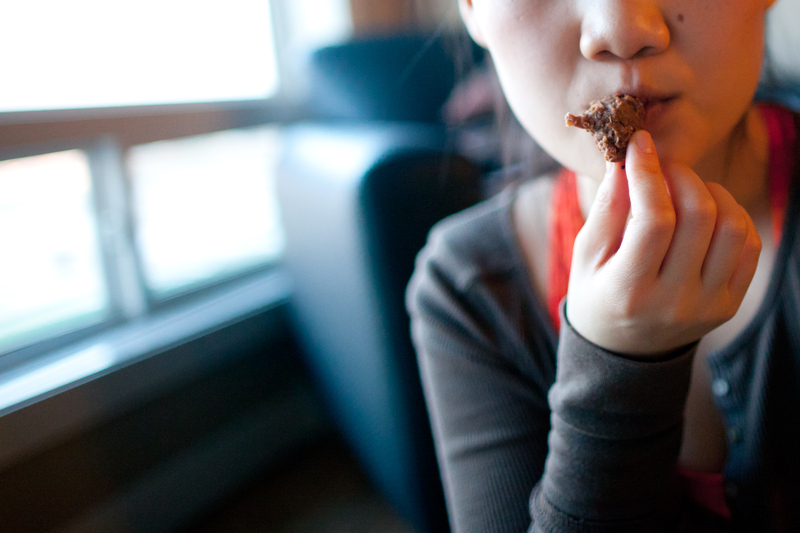 But, when paired together, it’s like the interlocking of fingers between two soul mates… in food form. Today I made these chocolate-banana-peanut butter-gluten free-oatmeal cookies. I know, quite a mouthful to say, but ridiculously simple to make and undeniably delicious. I seriously can’t believe I made these using only 7 ingredients! None of which, might I add, are butter, sugar, or eggs! The absence of refined sugars and reduction of saturated fats in these nutritious cookies makes me feel less guilty indulging in more than just one. I initially didn’t know what I was going to make; it could’ve been bread, scones, granola… I really just wanted to bake something using the ingredients I had on hand. 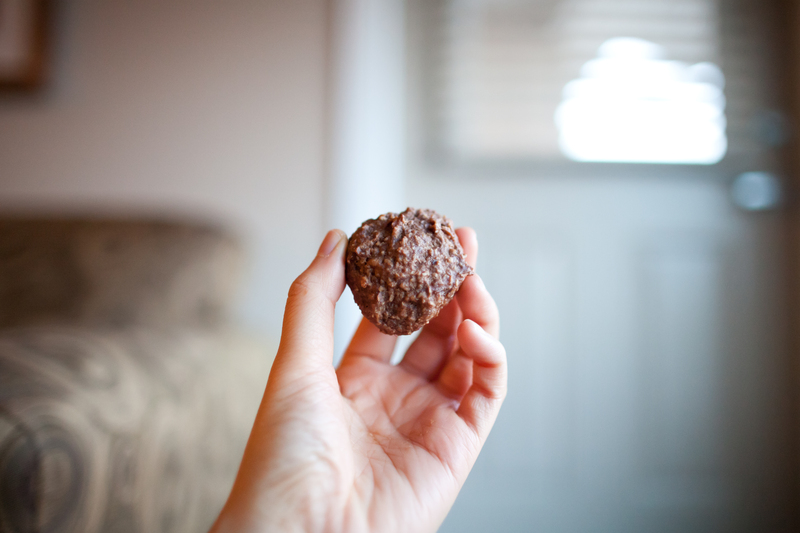 Little did I know that I was going to make some super delicious, moist mini cookies! This just goes to show how flexible baking can be and it also reminds us to be creative and willing to experiment with recipes. Sure, these might not look like your traditional cookie, but I can vouch that they are equally as delicious as any chocolatey, sugary, buttery cookie out there! The texture of these are very reminiscent of banana bread. The outer shell is firm and the insides are plush, moist, and bursting with flavour. As always, I used dates as my sweetener instead of refined sugar. I cannot stress how great incorporating dates into your recipes is. Per 100 grams, dates have 105 less calories, 8% less carbs, and 32% more dietary fibre than white sugar. If that’s not reason enough to switch to using dates instead of refined sugars, I don’t know what is! Rather than my usual almond butter, I grabbed the almond-hazelnut butter last week at the grocery store and my oh my, this stuff is life-changing. I kid you not, almond-hazelnut butter tastes like liquified Ferrero Rocher!!! Though, I guess it makes sense since Ferrero Rocher is a hazelnut cream-filled chocolate. But you guys need to try it! It adds something different to the cookie rather than just strictly using peanut butter. Place oats in a blender and pulse until milled into a fine, flour-like texture. It’s perfectly fine if there are a few larger pieces of unground oats- it will give the cookies more texture. Place ground oats in a bowl and set aside. Soak dates in 1/2 cup of warm water. After 5 minutes of soaking, transfer the dates with the water to the blender and blend until the no large chunks of date are visible and the consistency of the mixture is like a thick paste. Transfer paste into a large mixing bowl. Peel the bananas and mash them in the bowl with the date paste. Keep mashing until no large chunks of banana are visible. 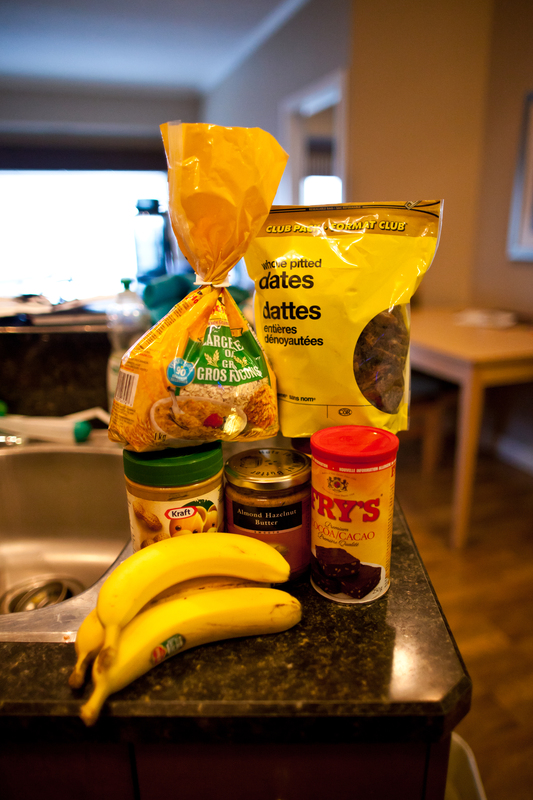 Add the peanut butter and almond-hazelnut butter into the banana-date mixture. If you can’t get your hands on hazelnut-almond butter, feel free to substitute with equal parts of almond butter or more peanut butter. 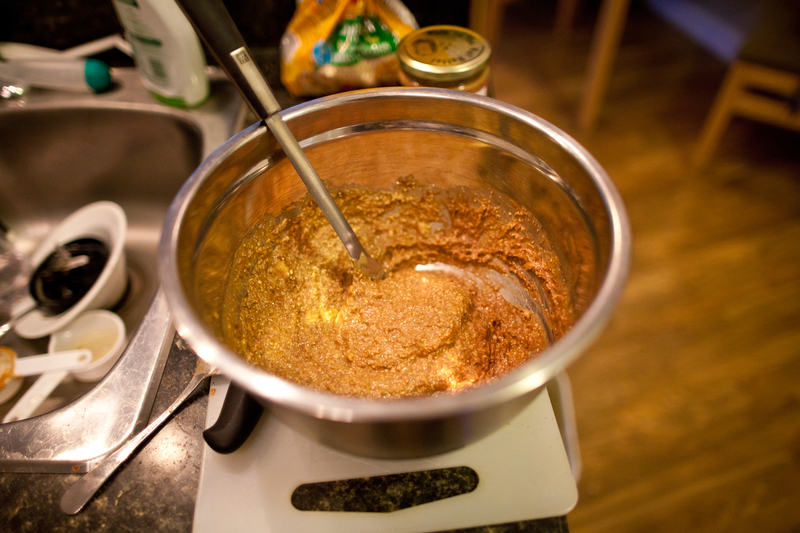 Once the nut butters are added, mix until everything is well incorporated. Add the cacao powder and baking powder to the mixture and slowly add the ground oats. Keep mixing and adding more oats a little at a time until all the oats are incorporated and everything is well mixed. Spoon the cookies onto a baking sheet lined with parchment paper. These cookies don’t spread out as they bake, so you can get away with arranging the cookies closer together/fitting more into one baking sheet. Bake in the oven for 15 minutes. Once they’re finished baking, let them cool for 5-10 minutes, then they’re ready to enjoy! I couldn’t be more happy about the way these turned out. I even put them to the test with my anti-health food friends (friends who think anything I make is made out of grass) and they really enjoyed them! They were surprised at how sweet they were despite not using any sugar. They also made a note that these would make a great on-the-go breakfast. The nut butters definitely gives you the protein you need and the oatmeal provides the bulk that’ll make you feel full! Baking these was such a great way to spend my Saturday evening! I hope you guys give these a try and please let me know if you do! Anyway, hope you’re making the best of your weekend and I’ll talk to you soon!